Apron plastic with pre installed display and bezel. Take glass of and lift playfield and rest on center playfield stand. On the playfield metal hangers there nuts and bolts that holds the original apron to the playfield. Plug one end of HDMI cable into the HDMI port on the display. Plug the micro usb cable into the usb port on the display. Run the other ends of both cables back under the playfield and up the back of the backbox. Use provided cable ties to secure cables. The HDMI cable will be snug between the metal ball arch and the display.. bend the cable to the left a little and the apron fits just in. Remount the apron with the same nuts/bolts used with original apron. There is a thin layer of peelable film on the top side of the apron to protect from scratch. Remove this film before putting glass back on. Here is how the electronics setup will come when shipped. I’ve connected pi power and the USB serial adapter already so there is no need to guess where those get plugged in. The only thing left to do is replace your apron, plug in the HDMI cable at both ends and run the power from the distribution unit back to the display apron. There is no need to run power from the power supply anymore. If done wrong, your could have fried your Pi. So, I’m eliminating that risk. Now, I can’t help it if you plug your power wires in backwards. 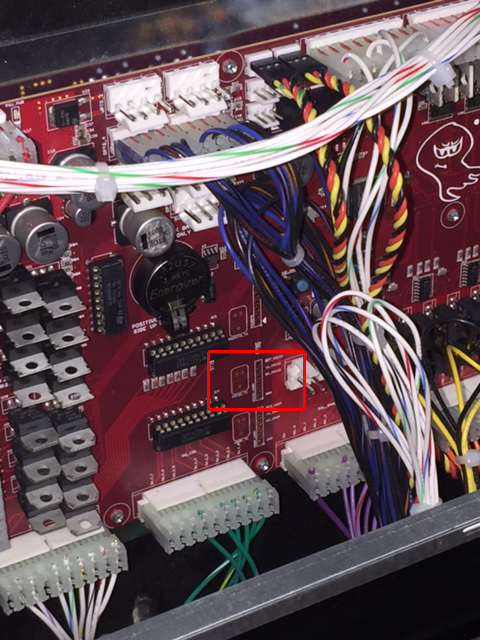 If you look at your pinheck board at the top left corner, that is the main power that comes from the supply to the board. I’ll have a close up pic on this are on the installation site showing how that power should be hooked up. 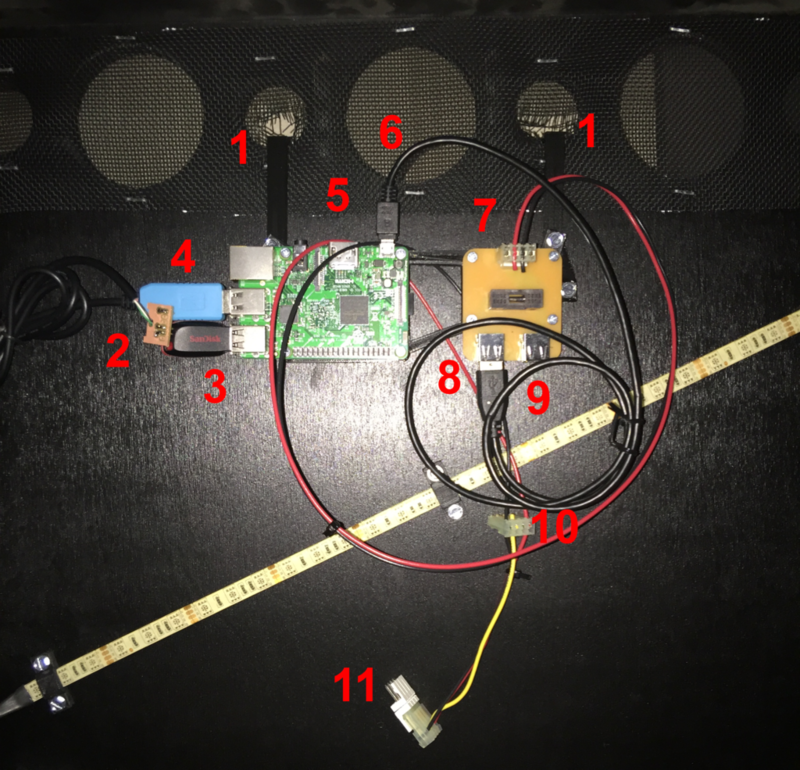 This is a prototype backbox, You will have two RGB strips in your game. 1 – These are the hangers. You can either pull that staples on the screen and slip under to hang the electronics, or slice an X to poke through and hang. The choice is yours. Although I do not recommend this, but some owners say they will take the hangers off and screw down the plate to the backboard. Just a heads up, that wood is super tough! 2 – Serial adapter to pinheck board. Installation web page had more details about how this plugs in, but this provides a solid connection to the serial power. 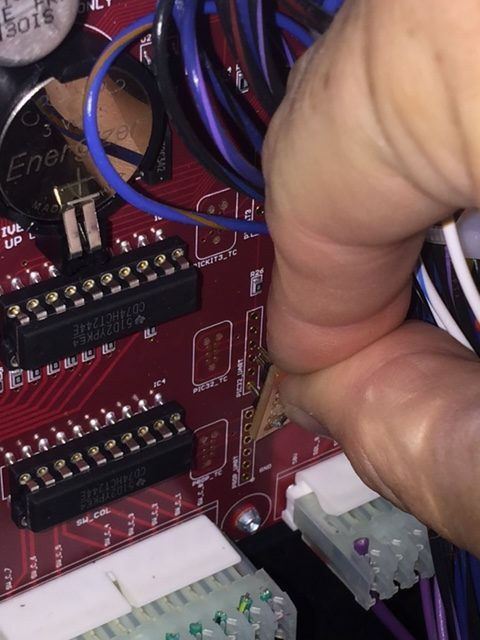 No need to solder header pins. 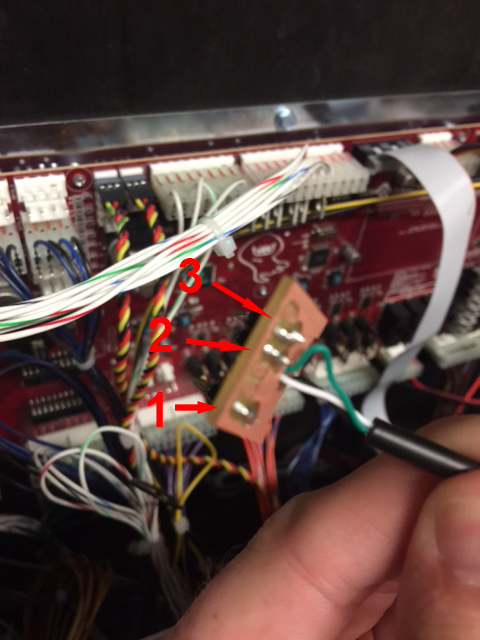 See below “Serial Cable” section for detailed instructions. 3 – USB Media drive. This is a 32GB drive formatted as NTFS, 32kb sectors. When you update your display, you can format if you like or delete the files/folders and replace with new content. The pi knows how to handle fragmentation. You should be able to use your favorite OS to update your media drive. 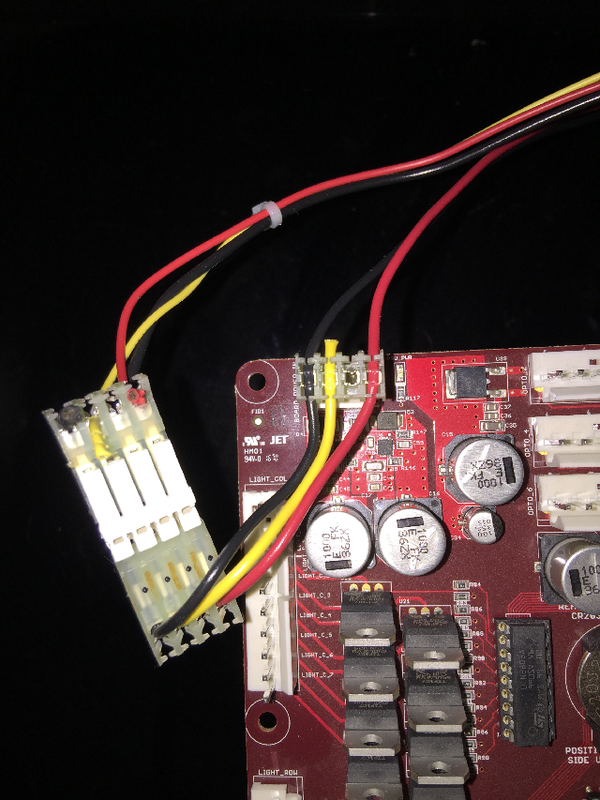 4 – USB serial adapter to the Pi. Do not plug this this into the power distribution unit, or the pi will never communicate with the pinheck system. It will come pre-installed. 5 – HDMI output of Pi. This will need to be connected at the time of install. Simply plug one end of the 15ft HDMI cable to the apron display and the other to the Pi’s HDMI port, making sure to run it under the playfield. 6 – Micro USB Pi Power. This comes pre-installed, and runs from the power distribution unit to the Pi. 7 – Main power to Power Distribution Unit. The power cable has two ends. One end has one IDC connector that plugs into the PDU, the other has two IDC connectors. (this will change as the Z connectors are really hard to find. It will be replaced by a custom circuit) On the double end. the end with the z connectors plugs into the power wire that would have plugged into the pinheck board. The other IDC connector in the “middle” plugs into the pinheck board. Pay close attention to the color order. 8 – USB power to the Pi micro USB. Comes pre-installed. 9 – USB power for the Apron Display. Run this from the PDU to the Display, under the playfield. 15ft USB to micro USB cable. 10 – “Middle” IDC connector plugs into the pinheck board. Here is the power cable to pinheck closeup. 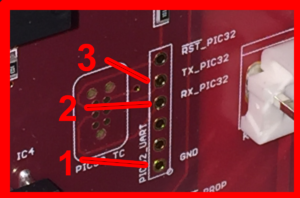 The IDC connector on the pinheck board is the “middle” connector on the power wire. You will have to unplug the main power from pinheck, and plug it into the “Z” connector on the new power cable. Making sure to match up the wire colors. Color order from left to right is Black / Yellow / Red. The wire with two wires only, goes back to the PDU of the hanger system. PDU side comes plugged in already. This is the USB Serial cable adapter. This is a modified version that has been retrofitted with solderless header pins. There are 3 wires used in this system. TX/RX (white and green wires) and GND (black wire). The pin by itself (black) when plugged in, is at the bottom of the other two pin. This is the section where the serial cable will plug in. There are 3 sections. We are only interested in the middle section. The adapter was designed to fit next to the Knocker plug. Please note that in this step it is helpful to have a lighted magnifying glass or use your cellphone in video mode to see whats going on better. Line up the black single pin to the bottom hole of the middle section of header holes, but do not push in yet. Use the bottom pin as a pivot to guide the other two pins to line up. When all pins are lined up, use even pressure across all pins and press into place. It will be a snug fit, but this gives maximum pressure and contact area for error free data transmission.